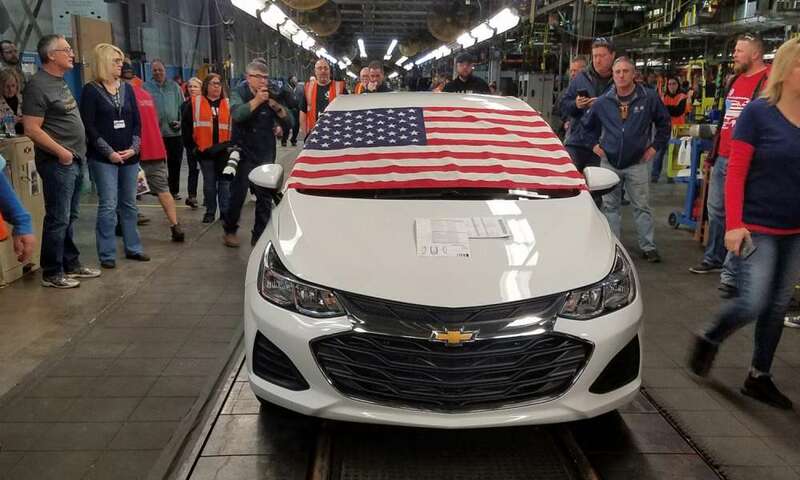 John Davies Jr., who says he’s worked at the plant for more than a decade, could have the plant as soon as he finished installing electrical components in the final Cruze. But instead, he said he followed the car down the line, using the opportunity to say, “We’ll see ya,” to his colleagues. “We didn’t say ‘goodbye,’ because we’re having hope that we’ll get another product,” said Davies. At United Auto Workers Local 1112's union hall later that morning, Davies held back tears as he talked about how the uncertainty will affect his three children, especially his 11-year-old daughter. On top of that, he said that working at GM had been a “dream” of his. Around 2:30 p.m., a few dozen people gathered outside the plant to commiserate, share their grievances. Some hugged, some cried. Many were employees who just worked their last shift. Others, like Jaquetta Steele, had already retired, but turned out to show support. While some former employees of the plant say they are hopeful that GM will assign another product to the plant, no such plans have been announced. That means the hundreds of workers have a difficult choice to make. Some have opted to transfer to GM plants in other states, others plan to bide their time in the hope that GM will reactivate the factory, and still others say they may return to school, seek job training, or simply pray. The layoffs are part of a larger restructuring of the company that was announced on Nov. 26, 2018. In addition to reducing its salaried workforce by 15 percent, the company said it would “unallocate” three GM assembly plants (in Lordstown, Detroit, and Ontario) and two propulsion plants (in White Marsh, Md. and Warren, Mich.). The moves would save the company $6 billion and leave it more “agile, resilient and profitable, while giving us the flexibility to invest in the future,” said GM Chairman and CEO Mary Barra in a statement announcing the restructuring. Green called GM’s decision to idle the plant “corporate greed,” but also blamed federal policies, such as President Trump’s tariff on imported steel and aluminum, which have made cars more expensive to build. Although the compact Cruze was at one point a bestseller for GM’s Chevrolet brand, the model had seen declining sales in recent years. During that time, GM has also invested more in producing crossovers, SUVs, and trucks. As a result, layoffs at the Lordstown plant actually began in January 2017, when GM eliminated the third shift. Later, about 1,500 employees were let go when the plant's second shift was eliminated in summer 2018. UAW Local 1112’s parent organization is currently suing GM in U.S. District Court for the Northern District of Ohio. A GM spokeswoman said last week that the suit has no merit and that the company has no comment beyond that. The second suit, filed in January, alleges that GM violated a labor agreement by hiring temporary workers at its plant in Fort Wayne, Indiana, thus taking up spots that some 690 Lordstown workers might have by virtue of seniority. The Lordstown Complex first opened in 1966. Its first production vehicle to come out of the 900-plus acre facility was the Chevy Impala, according to Youngstown’s WKBN First News. In the 1970’s, that was joined by the Chevy Caprice, Bel Air, and the infamous Vega. In the 2000s, the plant picked up the Cobalt. Then, in June 2009, in the midst of the Great Recession, GM declared bankruptcy, despite having received more than $13 billion in government assistance. All told, the U.S. government pumped nearly $50 billion into GM as part of its Troubled Asset Relief Program (TARP). That was later converted to a 61 percent stake in the company, which the government sold off in a series of stock sales concluding in 2013, according to Reuters. In a report issued in April 2014, a Special Investigator said that taxpayers lost about $11.2 billion on the principal TARP investment in GM. In September 2009, then-President Barack Obama visited the Lordstown facility and defended the federal government’s decision to bail out GM. “Your survival and the success of our economy depended on making sure that we got the U.S. auto industry back on its feet,” he said. In 2010, the Cobalt was retired and replaced by the Cruze. Today, GM is “back on its feet.” The company’s stock price is currently around $39, compared to 75 cents per share in May 2009. For the workers being laid off, the future is uncertain. John Davies Jr., who worked on the assembly line installing electrical components, says that he has not sought to transfer to another GM facility, unlike dozens of his colleagues. However, he adds, that he could at some point receive a “force letter” if one of the GM facilities accepting transferees needs more workers. If that happens, he says, he will essentially have no choice but to move.